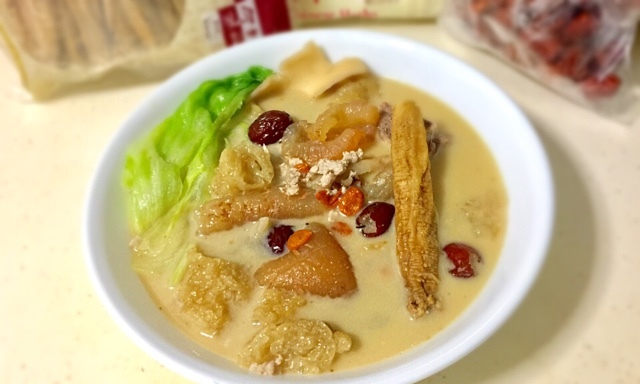 How to cook Herbal Sea Cucumber and Fish Maw soup good for ladies? Guess what? My TCM physician passed me another healthy soup recipe. I must say her recipes are so far, delicious! This week, she asked me to drink more sea cucumber and fish maw soup. I have never heard of sea cucumber and fish maw soup combined and being good for ladies. Her track record is so good so out of curiosity, I asked her why. She replied that I just had my period so I need to drink sea cucumber and fish maw soup to tonify my ovaries. I am a sucker for her recipes because not only are they delicious, I also feel healthier. She always "nagged" that I have to drink more water and get MORE sleep. When I approached the chiller, packs of sea cucumber were staring at me. Oh well. I got my answer. As for the actual amount of sea cucumber and fish maw, the specifications do not matter because she mentioned that this is considered diet and not medicine. Medicinal soups need to be specific. As for me, I used around 5 sea cucumbers (around 5 cm long). Please note: If you want the maximum health benefits for this soup, you have to buy dried sea cucumbers from medical halls and expand them before use. For my fish maw, I used four 10 cm pieces. 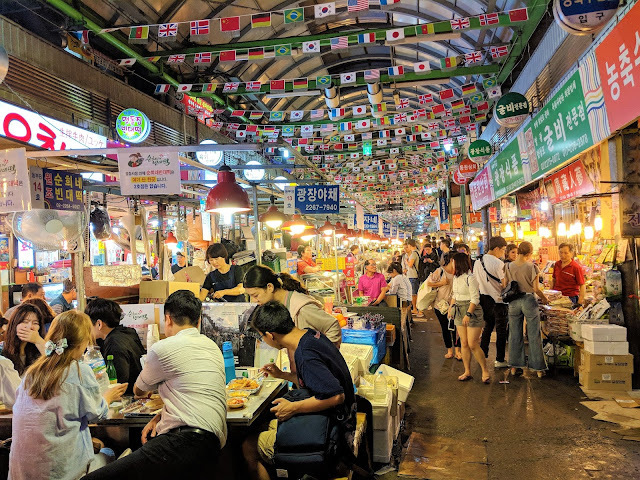 Please note: If you want to get the most out of this soup, the most nutritious fish maw is always the higher grade Hua Jiao (the DRIED ones usually from medical halls). But for Hua Jiao, you need to soak for a good few days. (Please see my blogpost for the recipe using authentic Dried Sea Cucumber and Hua Jiao.) For me, my work is hectic, so I used the ones which is not as high grade as they only require 10 mins of soaking. I got all my herbs from Eu Yan Seng because she says that EYS sells herbs of higher quality. Shops like EYS should just get TCM physicians to act in commercials. Another weird thing that she said made me raise my eyebrows. She said that the Jiang Pi (Ginger Skin) is very good for the body. Well, I forgot to ask her why. I also added my own Bak Chor (minced meat) into the soup because I love Bak Chor. To break up the Bak Chor, I scooped a ladle of hot soup, placed my Bak Chor in it and separated the meat in the ladle with the ladle in the soup. I separated the mince meat with a pair of chopsticks. I did not include this as one of the ingredients as this was my idea, not hers. She only told me to use spare ribs. Oh well, all belongs to the same animal, should be fine right. I filled up the pot with as much water as I could since I knew that it takes time to break down fish maw. It is an easy soup to make since I just need to dump all the ingredients in the glass pot and boil the soup. Once the soup boils, I brought it down to a simmer for around 1 and a half hours. As long as the fish maw is soft, it is ready. The fish maw from EYS has no weird oily taste, and it was jelly like soft. The sea cucumber was so soft as if it could melt in my mouth. The soup was very nourishing, tasty, filled with the evident flavours of both sea cucumber and fish maw, combined with the sweetness of dang shen - very yummy. As there is no Dang Gui, guys can also drink this soup. 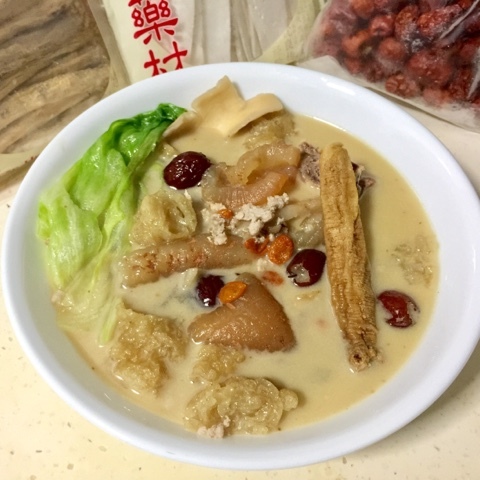 Please check out my blogpost for the recipe recommended by TCM Physician to use DRIED sea cucumber and fish maw. In short, she told me to keep drinking more soups cooked with only these herbs and also her fav, black beans soup. She warned that the body would suffer if we over tonify with strong ingredients so she said that I should just stick to these herbs and Ba Zhen Soup on the second day that the menses have cleared. Check out my Ba Zhen Soup post which recipe has been tweaked by her. Don't forget to share my post with the people you love and need some nourishment. Please like my Facebook Page and follow my Instagram. Hi, can you share how to thicken your hair and also the contact of your t cm physician? Tia! Pls share how to thicken your hair and your tcm contact. Thks. Hi, How are you doing? Do large bananas. It works too!